EverLine’s Ottawa office employs multiple highly trained and well equipped line painting crews that deliver expectation shattering results. Our line painting and road marking services are precise, durable and affordable. At EverLine Coatings & Services we provide specialized services to deliver quality and long lasting line painting services for parking lots. We employ experienced experts and use premium materials and equipment to deliver precise and durable line painting and road marking services for outdoor parking lots. Our specialization and experience will ensure that when your business uses EverLine’s road marking services you are receiving the highest quality work available. 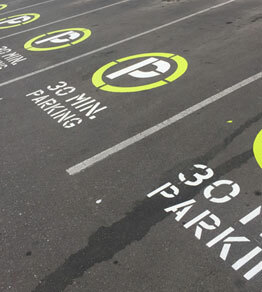 At EverLine we do not only specialize in line painting services for outdoor parking lots we also offer line painting services for parking garages and parkades. Parking garages and parkades require specialized equipment and crews with specialized knowledge to be painted properly. At EverLine we have the knowledge and equipment to handle your parking garage or parkade line painting project. Our variety of road marking services and materials allows us to work with your business to ensure your project fits within your budget while still meeting your durability needs and surpassing your expectations. When working with us you can be assured your parking lot will be painted to the highest of standards and last longer than any previous painting job you have had done..
At EverLine we understand that having your line painting project done quickly and in a time-frame that works for your business is important. This is why we have employed multiple line painting crews, so we can handle multiple locations on the same day or help a business that needs a line painting project handled immediately. We also employ multiple crews so we can complete your line painting project when it works best for your business. This means we can complete your project during your businesses down hours whether that be day or night. At EverLine we provide a number of advantages that you will not find with our competitors. One of those advantages is our multi crew approach. At our EverLine Ottawa office we have several highly trained and well equipped line painting crews. This allows us to do several things; first of all this means that we can provide a line painting crew on any day of the week at anytime. This means your business will not have to be disrupted by our line painting services, as we can come and finish the job during your down or off hours. Another advantage of our multi crew approach is that we can paint multiple parking lots at the same time. This means if your business has multiple locations or multiple lots at the same location we can get it all done at once. No need to plan multiple dates and worry about getting it all lined up, with EverLine everything can be done at the same time. Another fantastic advantage of our multi crew approach is that we can answer the call whenever needed. This means if you need your parking lot painted tonight we can have a crew ready for you. If you need immediate line painting services at your property we can handle that. In addition to our multi crew approach we are vehemently committed to delivering high quality painting projects. We focus on communication with our clients to ensure we are meeting and exceeding expectations throughout the line painting process. Our job is not done until you are completely satisfied. Part of being the best available line painters in Canada is ensuring we are offering the best available products to our clients. At EverLine we use the best of the best line painting products available with TBL Durables. TBL Durables is an industry leading line painting product that is significantly more durable than any other available line paint. To learn about even more of the advantages TBL Durables has over all other line paints please click here. At EverLine Coatings and Services we aren’t just good at line painting we are the experts. We have decades of experience providing road marking services to all types of parking lots and properties. There is nothing we haven’t seen and if you need it done no matter the line painting project we have direct experience. Whether it is parking lots, parkades, parking garages, pathways, roadways, outdoor recreational surfaces or more we have crews that have been specially trained and specially designed equipment to handle the job. When it comes to road marking projects quality and precision is the difference between a great looking result and an okay one. At EverLine we only deliver great looking projects, as we have an unwavering commitment to being the best line painters in Canada. If you need a line painting project done then you will want it done by the experts. There are steps your business can take prior to our line painting crews arrival to ensure we can complete a timely and high quality line painting service. First to ensure durability and precision please have your parking lot swept just prior to having your line painting services done. Next please ensure all vehicles have been cleared from the parking lot so our crews have the proper room to work. Also please make sure that any obstacles such as dumpsters or shopping carts and all debris have been cleared from the parking lot. Finally please notify tenant, customers or employees of the impending line painting project. This ensures our crews safety and helps them complete the job as efficiently as possible. At EverLine Coatings and Services we are not only committed to quality and providing expectation shattering results, we are also focused on delivering value. We know businesses have budgets they need to follow and we have experience working in various budget sizes. This is why all are pricing is done on a per job basis. There are many different factors in a project that will affect pricing and we will need all the detail about your project to provide the best possible price. To receive a quote on your project please contact us.